Karastan® first began manufacturing rugs in 1928. The original company was part of the department store giant Marshall Field of Chicago. It was called “The Wonder Rug” at the 1938 World’s Fair. Today, Karastan is located in Eden, NC, and falls under the umbrella of Mohawk Industries, Inc.
Karastan manufactures a full range of woven and tufted goods for the residential and contract market; today we will focus on their Oriental design rugs. The Karastan Axminster loom was the first power loom to produce rugs showing the pile yarns through the back, just like the hand-woven originals from the Orient that are their design inspiration. Karastan introduced a panel Kirman-style rug pattern #717 in 1937, which to this day is still their best-selling rug. Axminster rugs are produced by two methods – spool and gripper. 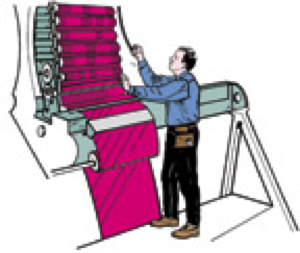 It is the spool machine, used by Karastan, that allows for as many as 50 colors in a single rug. For each row of tufts across a rug, the pile yarns are first wound in their correct order onto 1-yard-long spools. The required number of spools are mounted side by side. Each row of spools is attached between two moving chains in the order that the pattern will appear in the rug (Image 1). They use a weave called Kardax that takes the pile yarn through to the back of the rug, so the design is visible on the back as in hand-knotted rugs. New rug cleaners, when looking at the back, may think they have a hand-knotted rug. 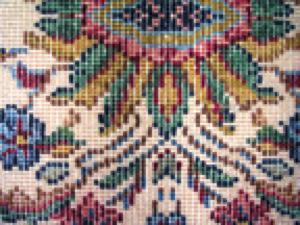 A closer inspection will reveal the thin warp yarns running the length of the rug (Image 2). Also, look for the Karastan label on the back of the rug. Some consumers believe, because it is an old Karastan, that it is a valuable antique. They are good quality, yes, but it is not a collectable rug. Karastan rugs are given a chemical wash to soften the colors, as are most hand-knotted Oriental rugs. The Samovar Collection is Karastan’s answer to hand-knotted tea-washed rugs. Karastan rugs are well made, using quality New Zealand wool and colorfast dyes, and cleaning problems are very limited. However, there is one consistent problem with all of Karastan Axminster Oriental design rugs. 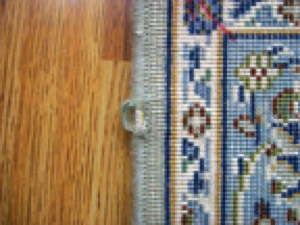 When the machine-made fringe is sewn onto the ends of the rug, the needles perforate the foundation, causing an inherent weakness across the ends of the rug. 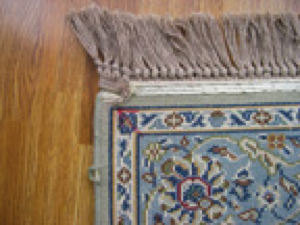 This causes the fringe to pull away from the rug, particularly at the corners(Image 3). This can easily be repaired, but be certain to point out the damage to your customer and document it before cleaning. Another problem you may encounter occurs with the side finish. Note the colored strip of cloth under the overcasting (Image 4). This material is not preshrunk, and when the rug is wet-cleaned it will shrink, curling the corners. Sometime just a good pull on the corner after cleaning will fix the problem. It is important to be able to identify a Karastan product, as you will often be called on to clean this classic American rug.